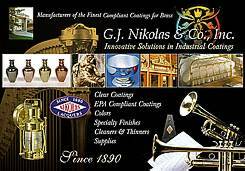 Press Releases: G. J. Nikolas & Co., Inc.
G.J. Nikolas & Co, ECO-BORNE product line is engineered to work with Ronci mass finishing machines, producing excellent, dependable results. Coating exhibits fast air-dry but can easily withstand 50 hours of salt spray. Available in any gloss or tinted color. For more information contact: G. J. Nikolas Co., Inc.
Make effortless conversion to full EPA compliance with ECO BORNE liquid coatings from G.J.Nikolas Co.,Inc.. Upgrade with little or no operator retraining utilizing existing process equipment. Full line of clear compliant coatings includes air-dry; bake; and catalyzed, in any gloss or sheen. 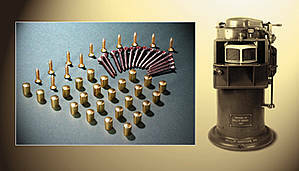 Also available in opaque colors and transparent toners capable of producing simulated brass, gold, or bronze on white metals. With over 110 years of brass coatings experience to draw upon, Nikolas products exceed industry standards for durability and quality. For information or a working sample contact: G.J. Nikolas & Co., Inc.
E-mail: info@finish1 G. J. Nikolas Co., Inc.